I am a big fan of Mint Juleps, a classic cocktail that is made with bourbon, sugar and mint. They’re usually found at the Kentucky Derby, where race-goers need a refreshing drink to sip while they are hanging out in the sun on a warm spring day. My only problem with the traditional julep is that the drink is quite strong and I need something that is going to last a little bit longer if I’m relaxing outside in the heat. My solution was to create a Mint Julep Iced Tea that is an even more refreshing take on the classic drink. The drink starts with sweet black iced tea, poured over muddled mint and bourbon. Muddling mint is a great technique that is often used when crafting cocktails to release the oils in the mint leaves, and it works just as well in iced tea. It also gives the drink a nice look when it is served to have the mint leaves at the bottom of the glass. Bourbon goes very well with black tea and the mint makes the drink especially refreshing and palate-cleansing as you sip it. This recipe is scaled to make one serving of iced tea. If you want to serve a crowd, I suggest starting with a large pitcher of sweetened black iced tea and then assembling the drink – adding the bourbon and mint to each glass – as you serve. 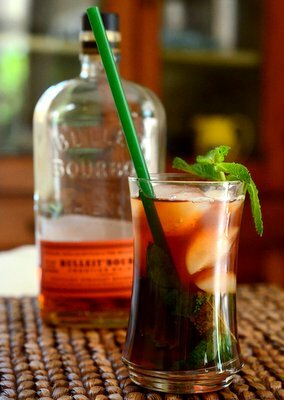 And, of course, you can omit the bourbon for a refreshing minty tea if you want the idea of a julep without the alcohol, too. In a small glass, dissolve 2 tbsp sugar in strong black tea, adding more sugar to taste, if necessary. Tea that is going to be served over ice should be prepared sweeter than hot tea. In a tall glass, muddle 1 tsp sugar and mint leaves until mint is well-bruised and a strong minty aroma is coming from the glass, about 20 seconds. Pour in bourbon and fill glass with ice. Top with sweetened black iced tea. Garnish with a sprig of mint and serve with a straw.